Will Blanden is a busy man. 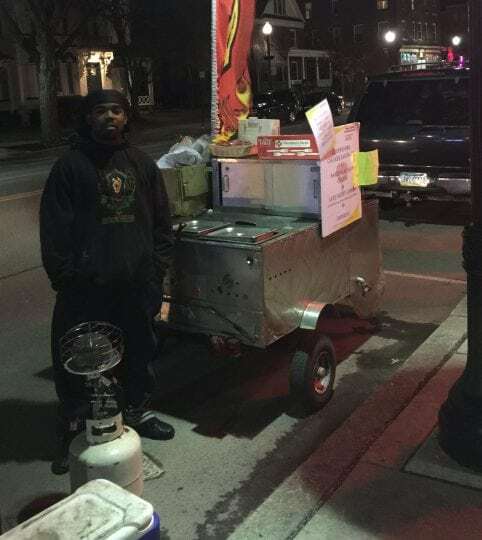 He does not mind staying out until 2 a.m. in the harsh Bloomsburg weather to serve up some grub for the people of Bloomsburg. What is Blanden serving? BBQ Sandwiches with mac & cheese. The $8 combo had been lacking in Bloomsburg’s late-night dining options. Hot dogs and pizza are great, but nothing hits home like a pulled chicken sandwich with baked mac & cheese. The cool thing about “Blanden’s Bad BBQ” is that it is a food truck. Nowadays, not only are Em’s Pink Wieners setting up shop in Bloomsburg on Thursday, Friday, and Saturday nights, but a second food truck sits down the street – outside of Hess’s Tavern. The majority of the Bloomsburg University students that walk by Blanden’s Bad BBQ do not know anything about the man running the joint. It’s nothing to get excited about, just a dude in his 30’s serving students their late-night fix. What are students missing about Blanden? He’s an MBA whose love for football and food has landed him in Bloomsburg. Blanden, 32, was born in Illinois but grew up in Connecticut. His parents owned a family restaurant that was in business for over a decade. Even at a young age, Blanden was exposed to the functions of a restaurant. Sports were also important for Blanden growing up. His father, Wil Sr., had three rules for Blanden that Will Jr. carries with him to this day. That is exactly what Blanden did growing up. He helped in the family restaurant with whatever his parents needed him to do, he played sports, and he kept his grades up. Blanden attended Howard University in Washington, D.C. There he earned his degree in accounting as an undergraduate, while also playing sports. Like a lot of college athletes, Blanden was not recruited to play; he had to earn his spot on both the football and men’s basketball teams as a walk-on. Luckily for Blanden, the coaches at Howard noticed the lessons about hard work that Will Sr. had instilled in him. Will Jr. proved himself and had a successful collegiate career as not only a student, but as an athlete too. On Howard’s football team, Blanden played quarterback, wide receiver, and defensive back. After graduating, he had his accounting undergrad, but decided that he wanted to stay in football as a coach. Coach Blanden, in his office at the Nelson Field House. 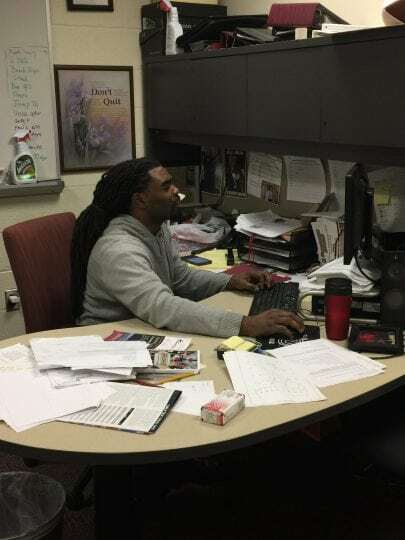 Blanden began his coaching career as a defensive backs coach at Western Connecticut University and began to pursue his master’s degree in business administration (MBA). Blanden got some more exposure to the food industry, working as a server at a local Olive Garden. After two seasons at WSCU, Blanden became both the defensive backs coach and a strength and conditioning coach at Nichols University in Massachusetts. In 2012, Blanden completed his MBA at Nichols. Prior to the 2013 football season, Blanden arrived in Bloomsburg, and was hired as the linebackers coach. He coached Bloomsburg’s linebacking core for three seasons, and then shifted over to coaching the defensive line in 2016. The 2017 season will bring a new challenge, as Blanden will become the team’s special teams coordinator, in addition to his duties coaching the defensive line. Blanden never played linebacker or defensive line in college, but this does not create any barriers between him and his players, regardless of position. For Blanden, coaching has been a dream come true. However, the experience Blanden got working in food as a youngster remains valuable to him.. While walking at the Bloomsburg fair in 2014, Blanden noticed an issue – “Where is all the BBQ?” he would ask himself. Blanden decided to take it upon himself to fix this issue. He started his own BBQ stand that has made its way to several fairs in Pennsylvania – Pittston, Wilkes-Barre, Bloomsburg, and others. The fair gig has its perks, but Blanden wanted more. Bloomsburg is a college town – therefore plenty of students roam the streets on the weekends looking for some late night food. 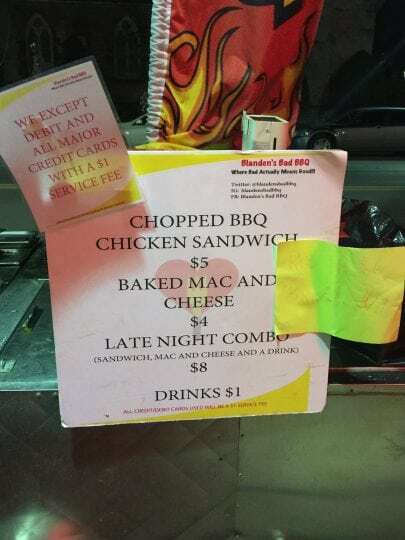 With BBQ not being one of the main late-night attractions, Blanden knew that there was money to be made. The food truck was born. Blanden running the “Blanden’s Bad BBQ” food truck outside of Hess’s Tavern. Aside from late weekend nights, the truck has made special appearances, including one at Block Party. Starting the truck was no easy task. Blanden had to go out of state to obtain the truck, and it was not cheap. He had figure out a way to balance the food truck with coaching, as the team was already playing games when Blanden started setting the truck up downtown in September last year. There were a lot of long nights and early mornings, but the truck had made its official debut. Business has been good for Blanden’s Bad BBQ since its inception. However, being the new truck on the block has its struggles. It is no secret that Em’s Pink Wieners, who has been operating a food truck in Bloomsburg for years, has a reputation. Right now, Will Jr. is focused on building his brand. Since opening the truck, Blanden has come up with a slogan – “Where Bad Actually Means Good!” Blanden is also working on some atmosphere enhancements for the truck, including a light-up sign. As long as Blanden is coaching in Bloomsburg, you can expect to see the food truck outside of Hess’s on the weekends. Will Jr. has no intentions of dropping the coaching gig, and the food truck will continue to grow. With lifelong experience in food, an accounting undergrad, and an MBA, Blanden’s Bad BBQ is in good hands.